LoyaL is a Project M Mr. Game & Watch main from Southern California. He is the best Mr. Game & Watch player in SoCal, and is considered to be one of the best of his character in the world. 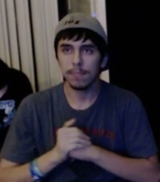 He has wins over players such as ThundeRzReiGN, Westballz, ilovebagelz, MorKs, and Sora. This page was last edited on March 11, 2019, at 03:52.